Creative Bath Systems is owned and operated by Bob and Jim, two brothers who have been working together in bathroom remodeling since high school. Bob and Jim learned all about remodeling and home building from their father, an architectural designer who taught them and who still works in the old traditional way. Jim and Bob have have 60 combined years of hands-on experience themselves. Jim was a master trim carpenter for 20 years, specializing in round stairways, cabinets, bookcases and custom decks. *Offer includes a white shower base and walls, two shelf corner caddy, Moen Eva faucet and shower head. 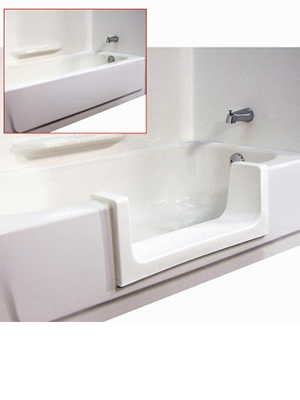 Affordable, Safe & Easy Alternative Entry into Your Bath/Shower Installed in less than a Day! Allow us to come out to your home and design the bathroom of your dreams. We carry a collection of fine wood vanities, cultures marble, transolid, and granite tops. Creative Bath Systems has a wide variety of bathroom fixtures (Moen lavatory faucets, American Standard toilets, towels bars, and lighting) A great selection of stone, ceramic, tile to help with the designs of your dream bathroom. We can help with all of your bathroom needs. We can design, and create your complete bathroom makeover.